Fecund. That’s the word leaping to mind as I walk the Maine shoreline at low tide. 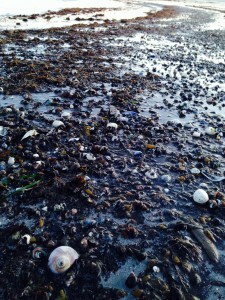 At my feet lies the detritus of the ocean: shells mixed with seaweed, spread along the beach as far as the eye can see. 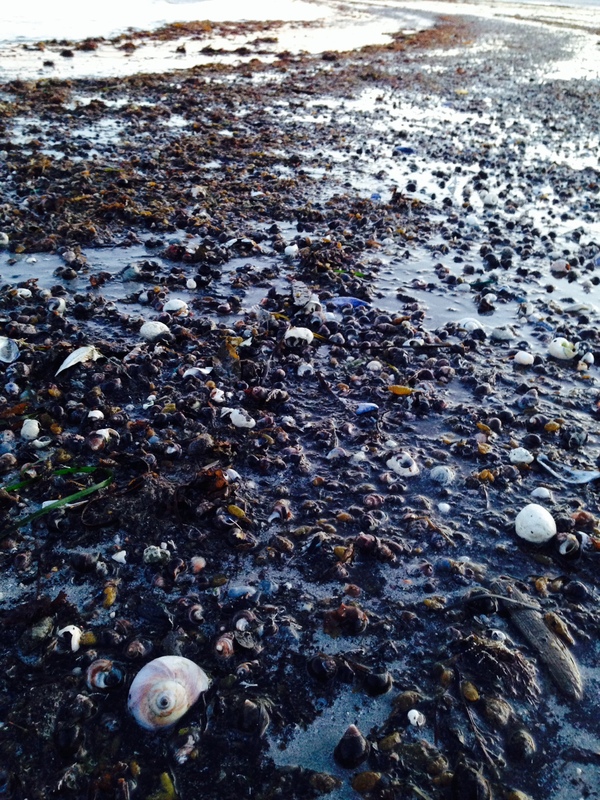 Knotted wrack, barnacles and snails cling to every square inch of nearby rocks exposed by the retreating sea. In shallow tide pools I find more snails, hermit crabs, and so many smaller life forms that it seems the water itself is alive. My wife Judy takes a wider view – her eyes locked on the distant horizon as the incessant, low roar of crashing waves washes her mind free of mundane thoughts. Impermanence is the word that leaps to her mind, and the shifting sands underfoot confirm it. All human constructs are like the sand castles built along the shore that the incoming tide dissolves. A few days later, we board a 65-foot boat that takes us twenty miles off shore, to the feeding grounds of finback whales. For an afternoon we are sandwiched between low, gray clouds and sea swells. The edge of land grows fainter in the mist until it disappears altogether, unsettling a landlubber like me. When the captain kills the boat’s engine, all we can hear is water spraying upward from blowholes as those behemoths surface. Their slick bodies shimmer in the dull light as they break skyward. Then they disappear beneath the waves. When finally we see one sucking in the ocean with its great mouth, we get a sense of what’s going on here. “Lunchfeeding,” the captain calls it – tons of fish converting into tons of whale. Back home, hundreds of miles inland, I return to my daily routine and the comfort of a green world that makes more sense to me. But for a few days I was reminded that we live on a water planet along with countless other life forms both great and small. The ocean is humbling, to say the least. I can’t grasp the sheer magnitude of it. 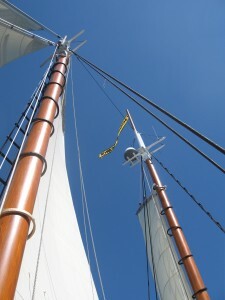 During a recent trip to the Maine coast, my wife Judy and I signed up for a ride on a 55-foot schooner. Funny thing about sailing, you can’t come and go as you please. We had to wait two days for fair wind. Even then, there was no telling where we’d end up. While Judy gravitates to the Atlantic shore with all its beaches, salt marshes and waves crashing against rocks, I’m more at home in the woods. 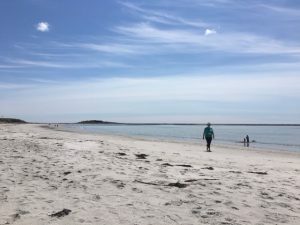 We both get what we want while exploring the many parts of the Rachel Carson Wildlife Refuge scattered along the southern Maine coast. That said, it’s good to step out and try something different every once in a while. Sailing is definitely something different for a landlubber like me. 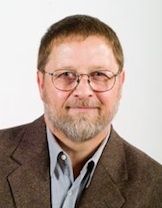 From the moment the boat pulled away from shore, I felt exposed. The ocean is big and dangerous. Nothing but water below and sky above. As we motored out of the harbor, I tried to shelve my apprehension and enjoy the cruise. Shortly after gaining the open sea, the captain cut the engine and ordered the crew to raise the sails. Then everything changed. Suddenly the wind was carrying us along. The schooner rose and fell rhythmically as it rode the waves. The sun shined brightly through the cloudless sky, a gentle breeze caressed our faces, and the coast rolled past slowly. The sails flapped quietly in the wind as we changed course. And all our hard, land-bound concerns faded away. Judy was napping in the lifeboat by the time we turned back towards shore. I couldn’t stop smiling. After the sail, we wandered along the coast aimlessly. We could do nothing but eat, drink and be happy. The ocean had massaged us. We were putty in its hands. 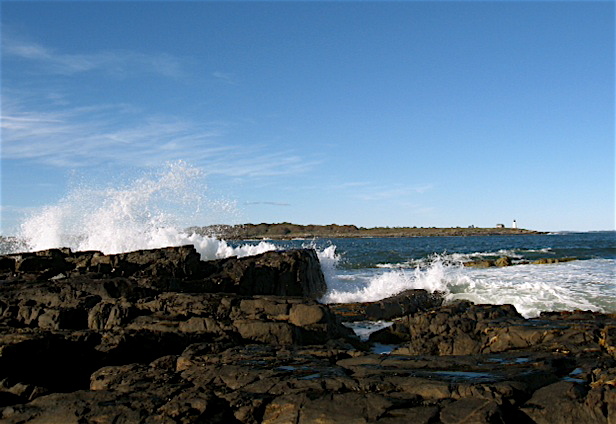 Judy and I took our annual trip to the Maine coast last week. Per usual, we rented a cottage overlooking a salt marsh. The view out the cottage window is very comfortable for a woodsy guy like me – all wetland and forest. But there comes a time when it’s best to crawl out of one’s comfort zone and see the world in a different way. So early one morning I hiked the half mile access road to Goose Rocks Beach then walked along water’s edge, taking it all in. On a misty, gray-sky day, the ocean horizon is indistinct, suggesting infinity. Waves break towards shore, wearing down all conventional notions of time. I walked the beach, all too aware that my boot prints would soon wash away. Impermanence. Only the ocean itself remains fixed in place – a vast body of water stretching beyond imagination. And yet it too is constantly moving, constantly changing it’s mood. The beach is covered with oceanic debris. Long rows of aquatic vegetation mark the tide’s high water line. And mixed into it shells, fragments of shells, the body parts of crabs and lobsters, and countless other organics in various stages of decay. Much like the forest, the shoreline reeks of decay – repulsive to my landlubber nose at first, then oddly sweet and inviting as I recall from whence I came. The ocean is the wellspring of all life on this planet. 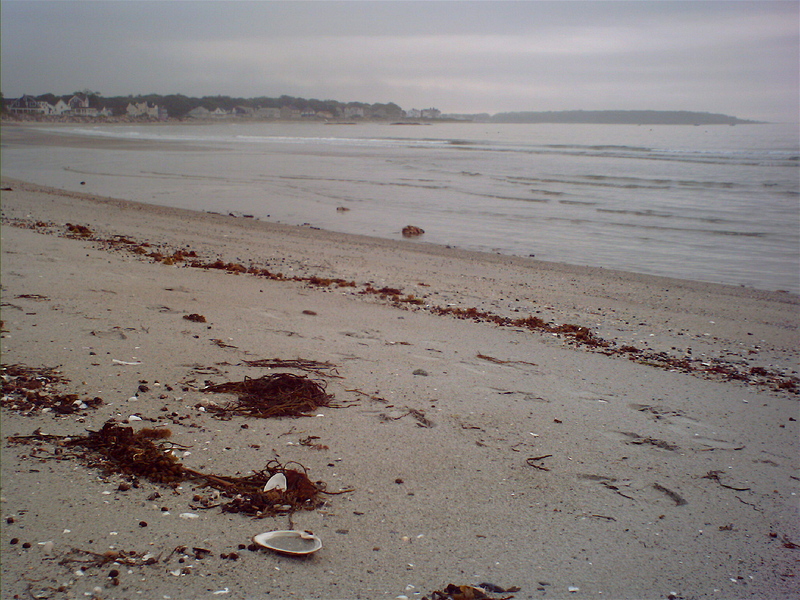 Nowhere is that more apparent than on the beach when the tide is going out. Sandpipers and plovers fed along the shoreline. Sand fleas cued them to the most scrumptious morsels. I skirted a tidal pool that seemed like a buffet to some of the shorebirds. A gull carried off something. Just off shore, ducks and eiders dove for breakfast. Much like the forest, the shoreline ecology is all about food. Funny how my gaze always starts on the horizon and ends up in the sand at my feet. I looked for things of interest among the shoreline deposits without knowing how such things are valued. I found a sand dollar, picked it up, then found another, then another. The currency of the ocean wild. My wife values them, anyhow. So does my granddaughter. I picked up a particularly interesting shell and stuffed it in my pocket. I’m not sure why. What the ocean coughs up is hard to resist. The waves continued breaking in my head as I hiked back towards the cottage, away from shore. Even now, days later, I can still hear it. In my mind’s eye, I can still see the foamy edge of the sea washing over the sand, leaving fresh deposits there. Nature’s watery hand is never still. What am I to make of this? Perhaps it’s best if I make nothing of it at all. Tabula rasa. Each new wave wipes the slate clean.